In the early days of summer, on the shores of a beautiful Swiss lake, comes one of the best genre festivals in Europe. Neuchâtel International Fantastic Film Festival has become a premiere destination for the cream of the crop of genre film, and the announcement of the first eight titles shows a bon for the audience. Colossal, which has already grossed over $2 million in the US, will brings monsters and mayhem; while The Endless will make its international debut with monsters of a different kind. Alex de la Iglesia's The Bar will keep audiences in a tight space, as will Cate Shortland's Berlin Syndrome, while Small Town Killers will show what happens when you get in over your head. Among these and other great titles, the festival has already outdone itself in programming. More details on the announced titles below. The Neuchâtel International Fantastic Film Festival unveils the first 8 films from the official selection of its 17th edition (30 June – 8 July 2017). These new cinematic gems are but an appetizer for the rest of the programme, and will be shown as part of diverse sections such as the INTERNATIONAL COMPETITON and NEW CINEMA FROM ASIA, as well as out of competition crossover showings of FILMS OF THE THIRD KIND and ULTRA MOVIES midnight screenings. It’s going to be epic! Two brothers meet up with the members of a cult they previously escaped from, unsuspecting of the unimaginable secrets they will be confronted with... Powerful and unsettling! What would you do if you were locked up in a coffee shop with a sniper outside? The master of Spanish cinema is back with this nerve-racking thriller filled with dark humour and human pettiness. Claustrophobics beware! The New Kids return with this insane comedy about Ron, an alcoholic moron who decides to become a professional stuntman for love… Buckle up! Two businessmen hire a contract killer to get rid of their tyrannical spouses. The wives are quick to retaliate with hysteria and Chardonnay. In this sensational tale, Anne Hattaway plays both a problem-ridden young woman and a gigantic relative of Godzilla’s. A ground-breaking (literally!) double identity. A young Australian woman is seduced by a charming Berliner who ends up holding her as his prisoner. This tense thriller focuses on the twisted and brutal relationship the two lovers develop between one another. Trapped in a glass tube that fell from the sky, the local neighbourhood population must fend off blood-thirsty aliens. Please ensure to bring double-layered vomit bags to this survival gorefest! Festival Pass offer: special discount (CHF 150 instead of CHF 170) on www.starticket.ch until June 15th. That's a lovely program, even lovelier fest. 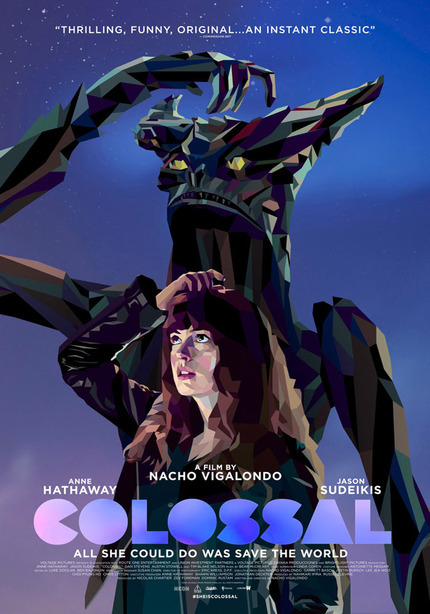 Want to see COLOSSAL again with the amazing audience they draw in every year.